Mark another bucket list item off, as I was fortunate to visit the Apostle Islands National Lakeshore Ice Caves a couple of weeks back. It was a long round trip journey just to ensure that I was able to see them, as the ice caves were only open for a few weeks this year. After walking out on the ice after getting to the parking lot a 6:45am, I was able to get some decent shots of the caves. The total number of people at the caves that day was about 15,000. Highly recommended if you ever get the chance to make it up north in Wisconsin. A few years back, I build a Photo Booth for a friends wedding. 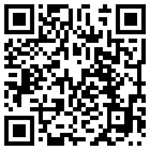 The build journal can be found here. Since then, I've used it a number of times for different events, but haven't really put any effort into marketing the solution. It's actually a ton of work to get everything set up, but each time I manage to use it, it's a blast. I've already done 3 events this year, with 2 of them being at my normal job at corporate events. I thought I'd post here to give an update that that Photo Booth is alive and well, and still delivers fun and excitement to any event! Educators Credit Union Tech IT Up A Notch! For more information on the m2 Photo booth, visit www.m2-booth.com. 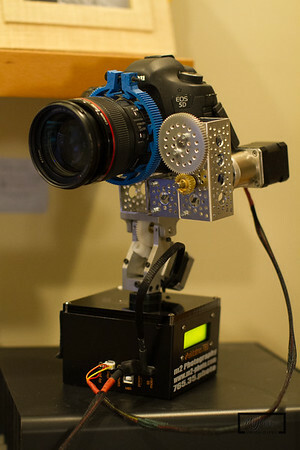 eMotimo sells an accessory for the TB3 called the Turntable for use with product photography, stop motion, or video. 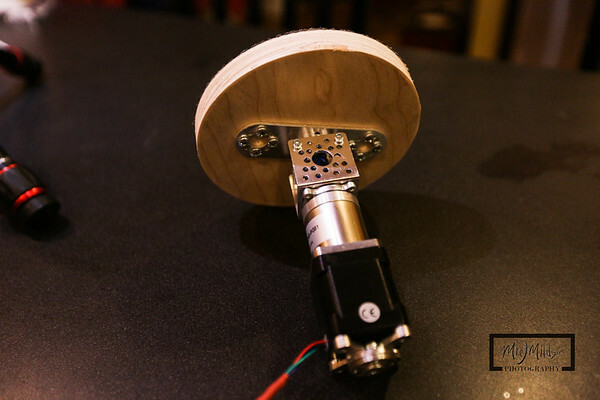 Using parts from servocity, I was able to make my own DIY version of the turntable. I purchased the stepper motor from stepperonline, and the 8mm to 6.35mm coupler off ebay. Otherwise the rest of the parts are Actobotics parts from Servocity. 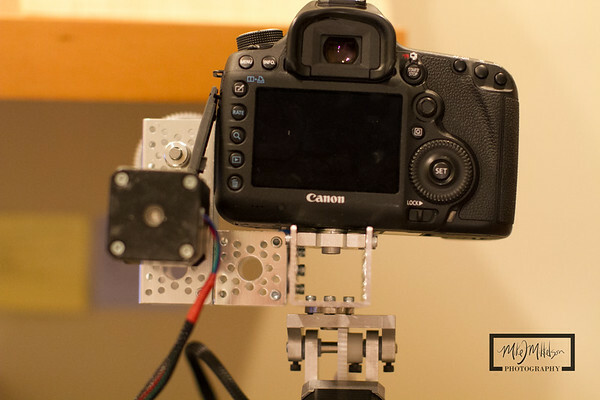 To have the ability to mount this to any tripod, I used a combination NEMA 17 mount and 1/4" threaded screw plate attached directly to the base of the 51:1 geared stepper motor. Here you see the complete turntable rig attached to a Mefoto Day trip tripod. I used a piece of wood that I had CNC'd for this project as the table, and attach some non-stick shelf lining using spray adhesive. The wood "table" was attached to the bottom using wood screws and an Actobotics flat bracket D. Using a hub mount, flanged ball bearings, 1/4" d-shaft, a set screw hub, and a 1.5" aluminum channel, I was able to mount the top part of the rig to the planetary stepper motor using a planetary mount. Please be advised that the Actobotics planetary gearmotot mount B does not fit any of the stepper motors that I've purchased from eMotimo or stepperonline. I'm not sure if there metric version of the planetary mount, but the one I had looked like it was made for a specific motor sold by servocity. I was able to drill deeper into the aluminum to make it work, but had to make modifications to the part. 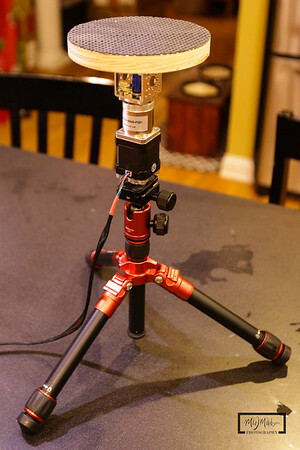 Using a NEMA 17 mount would probably be a better option without having to do any drilling. Servocity also does not sell a 6.35mm (1/4") to 8mm coupler, so I bought mine form ebay. I like this version, as it has set screws on both sides of the coupler for a tighter grip on the d-shaft. The entire rig including postage cost less than $100, and postage for all the parts was almost $30. Here is a test time lapse using the DIY turntable. I had the camera on automatic white balance, so there is some flickr in the shots. I just wanted to see how it worked. 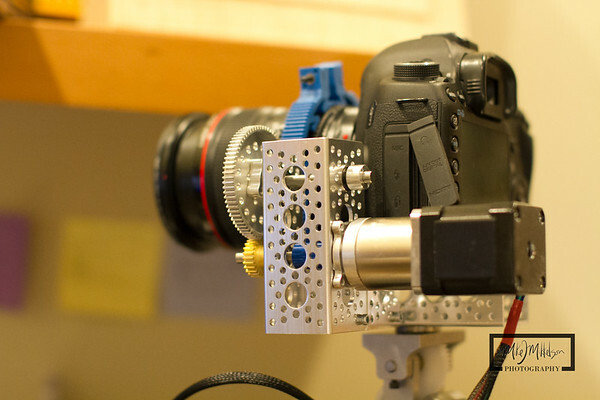 Another great DIY accessory for the eMotimo TB3 and my photography toolbox. Drink Wisconsinbly! Although I've had this idea for a long time, I never could figure out ho to accomplish it. 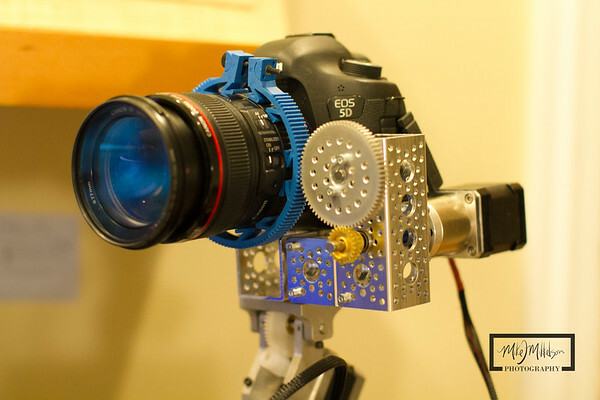 Recently, I saw a video post from photographer Mike Ver Sprill, (@MikeVerSprill) on his DIY slow motion zoom rig using servocity actobotic parts. His build was the inspiration behind mine, and I hope that it works as well as the one that he created. 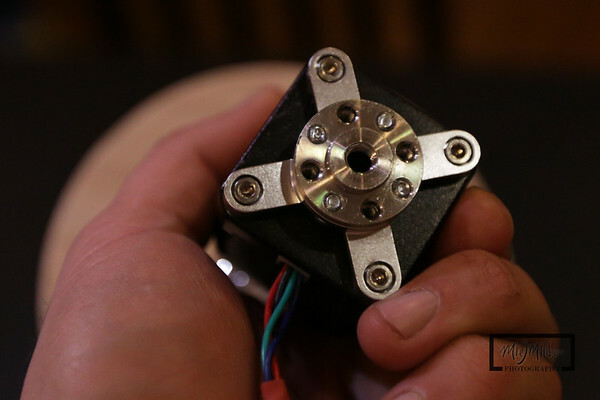 The main difference between my build is using stepper motor versus a gear motor. I actually have the same motor controller that he used, but is currently being used on my servocity cable cam rig, but I'm not sure if that would work with the eMotimo TB3 as the controller. 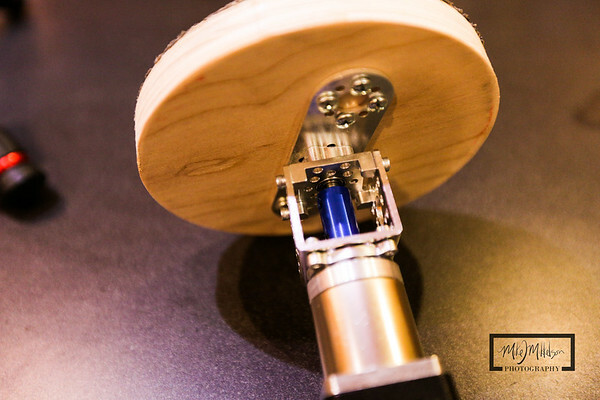 Since I already had the TB3, the simplest method was to purchase a geared stepper motor to use on this rig. Since the zoom, doesn't have more than a couple inches of travel, I needed a motor that would turn very slowly. I chose the 51:1 Planetary gearbox NEMA 17 stepper motor. I already have a 27:1 that I use on a 6 foot rail, and didn't think that was slow enough. I probably could have gotten away with the 71:1 or 100:1 to really slow it down. To wire the motor to work with the eMotimo TB3, you need a Molex Jumper 4 Wire Assembly that is available from sparkfun.com. The remainder of the parts, except for the 1/4" bolt to attach the camera to the rig, the lens gear, and the shaft coupler came from ServoCity.com. The follow focus microLensGear was from RedRock, and used a 32P Pitch, which aligns with the Actobotics gears perfectly. FYI: The Actobotics planetary gear mount does not align with the screw holes. I'm not sure if all of the motors that I have are metric and the servocity mounts are imperial, but I needed to drill some additional space to get it to work. There is always the NEMA 17 mount that I used on my rover build, but this way is much more seamless, and gives you additional shaft length to clamp onto. Here is a quick demonstration showing the rig moving and zooming. In a real world example, the rig will zoom over a long period of time, probably hours. I will use this rig mostly for star trail photography, and adding the motorized zoom will give my pictures a vortex effect. I'll post images as soon as it's warm enough to go out the test the new rig! Thanks again to Mike Ver Sprill for the inspiration.